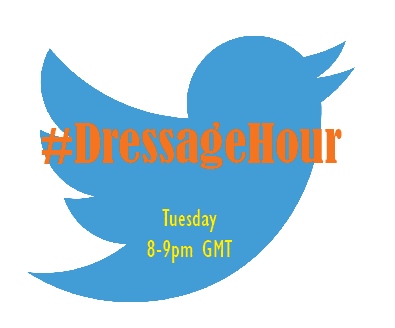 #DressageHour Despite the very sad news earlier this week that E-Dressage was ceasing trading, #DressageHour will be continuing as usual at the same time, Tuesday 8-9pm GMT. Ruby Butchers (@TheRubyPepper) from the EquiPepper blog and Ros Dobson (@rosdobson) from Ros D Equine will be hosting the Twitter chat hour from their own Twitter accounts with help from other members of the community. The chat hour will continue to be about reaching out to the wider equestrian community and sharing tips, tricks and stories and everyone involved hopes that it will continue to be as fun and successful as it always has been. It is also the perfect place for equine bloggers and companies to come and share their posts and products. #DressageHour takes place on Tuesday evenings 8-9pm GMT, right after #EventersHour and just before the brand new #PonyHour. Make sure you follow @TheRubyPepper and @rosdobson and use the #DressageHour to keep up to date.